Founder of the Muslim American Leadership Alliance, Zainab Zeb Khan, reflects on the importance of oral history in preserving, exploring and understanding the many identities within the Muslim American community. The Muslim American Leadership Alliance (MALA) has its genesis in storytelling. And as MALA has grown since its inception in 2015 to include leadership development and arts engagement, the organization remains deeply anchored in its oral history collection. As a grassroots non-profit dedicated to fostering cultural pride, we hope to serve as a research center and repository for stories that have cultural, artistic, aesthetic, and historical significance. The oral histories that MALA collects are archived at the American Folklife Center at the Library of Congress through a community partnership with StoryCorps, and are a key component of the LOC collection on the Muslim American experience. Titled “Muslim American Journeys: In, Out, and Through,” the groundbreaking joint venture is building a unique collection focused on our complex identities, challenges, and triumphs. MALA’s stories span the United States, and include immigrants, refugees, asylum seekers, veterans, as well as families who have settled in the United States as early as the 1800s. The Muslim American community holds the widest range of diversity in the United States, spanning different ethnicities, nationalities, and socio-economic demographics. These recorded and documented histories ultimately help avoid sweeping generalizations that stereotype people, engender prejudice, and overlook important variables in any historical context. Many of our storytellers have also experienced life in closed societies, where basic human rights – such as freedom of speech and women’s rights – were severely compromised. War, conflict, trauma, and other forms of turmoil undermine and weaken cultural identity. These storytellers have shared how our national values of freedom, democracy, and opportunity allowed them to draw new blueprints for their lives. MALA provides a platform where their voices and identities can be re-centered, allowing for the preservation of the richly diverse and vibrant communities that are now fused into the American experience. And oral history is not simply the property of the past: it can be a powerful catalyst for change. And oral history is not simply the property of the past: it can be a powerful catalyst for change. The documentation of lived experiences can significantly contribute to society by celebrating, challenging, and re-defining our national identity. In a country as diverse and complex as the United States, the histories of Muslim Americans remain layered and contested. By sharing a broad range of diverse narratives and experiences, MALA’s grassroots efforts aim to help Muslim Americans be proud of their identities while strengthening social cohesion in America. In the process of preserving these unique histories, we can explore new, emerging expressions of identity in the present and future. The project fosters inter-group awareness, respect, and multicultural understanding. MALA’s oral history project also opens the richness and diversity of the Muslim American experience to the American public at large. It celebrates the significant influence and contributions of Muslim Americans in the US; through these stories, we hope to stimulate inter-cultural dialogue that promotes tolerance, understanding, and a sense of shared community. Through personal narratives, MALA challenges stereotypes and the “essentialized” views of what Muslim identity truly means. It is vital to empower communities at risk, raise awareness about conflict, and preserve pride through the collection of such stories for generations to come. MALA’s long-term vision for its oral history project includes the desire to preserve a collection of stories that will ultimately facilitate research, strengthen teaching, and provide opportunities for life-long learning in the humanities. 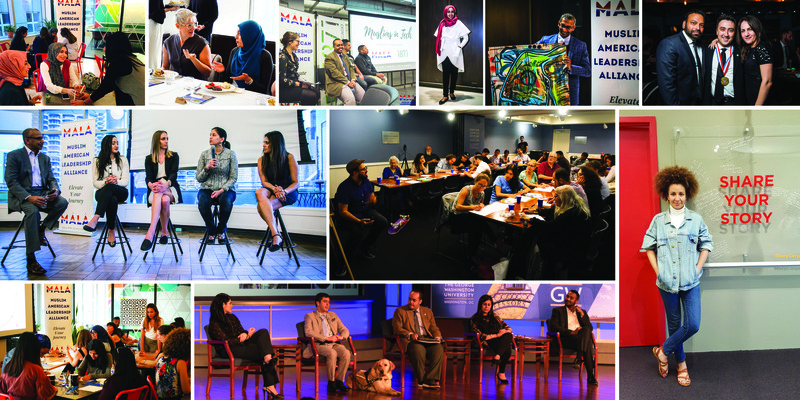 By providing a place for Muslim Americans to share their stories with their communities and the general public, MALA hopes to enhance popular discourse, positively impact perceptions, and inspire a refreshing perspective in the area of values, traditions, and beliefs. MALA is proud to provide a platform where we can learn what we don’t know, and help others gain insight into our shared American heritage. MALA is excited to be presenting at the Oral History Association conference for the first time, where we will discuss the complex challenges of surfacing voices from an extremely diverse community with multifaceted identities, and the role that oral history can play in the power of belonging. Zainab Zeb Khan is Chair and Cofounder of the Muslim American Leadership Alliance. Born in the US to Asian immigrants, she became an activist after eye-opening experiences counseling survivors of domestic violence and organizing exhibitions for artists facing repression. A former Senior Clinician holding a Master’s Degree in Clinical Psychology, Zainab also co-curated the International Museum of Women’s exhibition “Muslimah: Muslim Women’s Arts and Voices” and served as a United Nations Association delegate to the 59th Commission on the Status of Women. Most recently, she contributed a chapter to the book Can Art Aid in Resolving Conflicts (Amsterdam: FRAME Publishers, 2018). Oral histories can be accessed on MALA’s SoundCloud channel and website.